I really need help from someone in this matter. Please contact me when you get this message as I need to speak to you regarding a problem I am facing. Presently I am living here in Dammam with my kids. I read your article on the internet which is complete solution for all the current ummath is facing and the actors are taking the advantage and making money of that, you have given well clear picture and simple understanding way. May Allah give you jaza e khair, for this effort which you spend for this article and learn this elim for the ummath. Unfortunately, presently I am victim and suffering from this problem which already been suffered my mother and died on 05.05.2009, since we are un aware of all this and we just belive on Allah and rasool quran and hadeeth, never before suffered any body in our families and around and do not have any experiance of all this. But when my mother died and I am affected I am going through all this things which is true and with the help of quran can be removed. 1) 3 days before my mother death, she confirmed me that somebody done jadoo on her so I dont belive it as normal because we never face such things, after 3 days I got the news that my mother passed away, I feel very much sad and travelled next day to India. 2) when I reached India-Warangal to my home they already berried one day before of my arrival after sitting 15 minutes at home, I went to grave yard where my mother placed, I took out my shoes,socks and done wazoo there and with uncovered legs without shoes/socks went inside qabarasthan and spent little time and did dua with on my mother's grave and sat around with full of my tears but I controlled much. 3) then I came back home and slept at 12.15 after 15 minutes I started huge with big sound "cheekh and cry" with lots of louds all the peoples came around to me and gave me water but all this things I dont remember what happend, it is same thing happend to my mother also in the month of Jan 2009. 4) After that I approached to one amil he gave bandish and taweez which I am using now but still my head is jammed and receiving shaitani dreams every night. 5) I approached here also in Dammam one Alim saheb he read it there is change Alhamdulialh but not cured completely as I think, because when I go for sajdah in namaz I feel there is liquid in my head which is coming and jamming in my forehead there is some thing on my top of the head like any liquid or some thing which is always little heavy feeling, when i read quran or namaz its ok when i do not read its heavy, before it was like this, when I read quran it was feeling heavy and in the normal time it is light. I dont know which magic is inside my body now? should I follow the procedure of "voodoo Doll magic" or which magic. Please help me that I am out of India and I can not offered to come back again to India, to get ride of this problem. May Allah give you jannath for this help. Waiting for you response as soon as possible. respected brother in islam ASW. i was surfing on some sites today and found you email id there and the details submitted by you on various sites. the information provided by you are helpful for all peoples. may ALLAH give more knowledge to you and mercy on you. i wanted to ask about a lady working for us here. her husband drink Alcohol (Shraab) and beats his wife and children too. can you please tell me any dua or amal for the lady though she recite and her husband quit drinking, or any other thing you better know. ASSALMULKUM.I WANT TO TELL U THAT MY ENEMIES ARE MADE BLACK AMGIC ON ME THAT I AND SAMIULLAH ARE FRIGHTENING ALL THE TIME.PRAY FOR ME THAT SAMIUULAH SHOULD NOT FIGHT WITH ME AND HE SHOULD FAVOUR ME ALL THE STEPS OF LIFE.DUR GOHAR,RAKIFA AND JAHANGULAND OTHER CRUEL WOMEN ARE DOING BLACK AMGIC ON ME .PRAY FOR MY SUCCESSOR AND PRAY THAT THIS BLACK MAGIC SHOULD BREAK.I SHOULD BE SUCCESSFUL IN THE EVERY FIELD OF LIFE.PRAY TAHT SAMIULLAH SHOULD NOT FIGHT WITH ME AND HE SHOULD CARE ME ALL THE TIME.I WILL THANKFUL TO U. IAM 32YEARS OLD.I WILL WAIT FOR YOUR FEEDBACK.THERE IS AVOICE COME IN MY BOTH EARS.PRAY THAT THIS MAGIC SHOULD BREAK ON ME AND I GET THE HEALTH. IWILL WAIT FOR YOUR FEEDBACK. Brother, my name is Syed Rashed, I live in Bangladesh, I read your topic in a forum and like they way you describe everything very easily. Brother, I pray namaz 5 times, sometime Margib miss because on that time I m in road way to home. My problem is in my family, before 6/7 year we have a good family with 4 brothers and 1 sister with my mom and dad (I m 2nd son), but after that my big brother have some bad thinking about me which I don’t know for why. And I did not found any issue, I hope someone don’t like our family as much as good. Can you please break if someone do black magic on my big brother or my family. I m ever great full to you. HI I WOULD LIKE TO KNOW DO YOU KNOW HOW TO SPELL A CURSE ON SOMEONE THROUGH VOODOO DOLL. COSE I WANT TO SPELL IT ON SOMEONE. WHO HAS CHEATE ME AND I WANT HIM TO SUFFER I WOULD LIKE TO KNOW CAN YOU DO IT FOR ME AND WHAT DO YOU NEED TO DO. WHAT ELSE DO YOU NEED. AWAITING FOR YOUR REPLY URGENTLY. stop these attacks is by attacking back but it depletes me. Can you help me nullify the Voodoo technique used on me or guide in the right direction or towards the right source? The attacks are so powerful that I am unable to sleep at night at times. Overall, I have always felt that I was assigned this problem by God for some specific purpose but I have not been able to fulfill that purpose. Also, a block has been placed on my income sources. Two months ago I contacted a healer and he took few weeks to make a opening but it was blocked again after a month. BTW: I have 3 people including myself who are seeking help with Voodoo. Any help from your side will be a blessing from God. Thanks for your time. 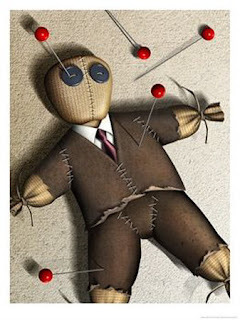 I have a friend who is suffering from the voodoo doll type of black magic. I was browsing the internet for ways on removing this type of magic and I came across your post on the website. My friend can't actually read these verses as he cannot read the quran. He has tried learning it many times over the years but finds it very difficult. However he is suffering severly from this black magic and I really want to help him. Can I read on the water and leaves myself and then give it to him to bathe in? And also what do we do with the small quantity of water that you have said seperate? Does he drink that after bathing? What are leaves of bare? And also it says recite a durood 707 times, surah fateha 41 times, and the last 2 verses of surah bakara (284 & 285), and the 4 kuls 41 times each? Is this right? And then after bathing he should read ayat ul kursi and 4 kul and blow on himself? Sorry for repeating everything and asking so many questions but I want to be sure that I understand everything clearly as I do not want to make him worse. it below for you to refer to. Please could you help me I feel so helpless knowing he is getting worse day by day. im suffering from magic dont know what type but i feel pain into my body especially in my hands and im always hot but feels like it not from something different type of temperature and i always ses a a small dot of light stars shine in the sky which is very sorry for my language but i dont know how explain i tells what feel like. i followed her but not having on this because this i never heard about jadoo on me and i was taking it like mental stress and this is the reason i dont followed her because we had all the treatment and i was feeling much better. here we have joint family and we have lots of tensions and disputes among us regarding every time we have tensions but upon all the family this time i feel like they directly telling to me so thats the reason i dont believe in adoo and took it as mental stress.now i have lots of knowledge about sihr its symtoms and also the tretment is almost same after reading the views of other people. i told to my father,brothers and sister but no one is believing me may be bcoz of my last two- three years behaviour and iwas making some stories that was my questions unable to tell it properly. everyone was wants to runaway from me and after sometime i was running from everyone.day by day the situation is becoming worst and im fedup with all this and i want to come out of it but no one is believing me.no one told me that im going through jadoo except that alimah.now my question is after this long time can it be possible have a treatment i have very less hope. now can i follow the same treatment what she said before im alone dont know what step should i take to be free from thisand no one is taking as jadoo and im taking as jadoo and i want the treatment.alimah told that knows one person give treatment to jadoo so shall i go to him but im afraid to whom should i believe ,the alimah is not receiving my phone she is avoiding me i dont why but itrust her bcoz she is the only person who maks me aware of it and also showed the treatment and prcautions. please suggest me some treatment and also advice to deal with people. Let's be strong. I am only here to encourage all of you, that the only way these psychological problems will overcome you, if you really start to believe them. Let's pray to Allah to give us the power to be strong believers and follow his path. If you keep yourself clean and away from fith, no evil forces can overcome you. Always remember Allah. I'll tell you a dua that is light on tongue and so powerful, subhan'allah'hi wabi'hamdi'hi and Allhamdulliah! Keep reciting them through out the day. Learn the meaning of it so it can take over your mind. Don't let these false peers and muridis take ur money and time. However the above post is clear and is simply telling you to make remembrance of Allah. May Allah bless you and give you the more happiness in this world.